The terms music staff and music stave are interchangeable. Staff tends to be the American usage and Stave tends to be the British usage. I shall use staff on this site. The position of notes on the lines or in the spaces determines the pitch of the note. Pitch is how high or low a note is. The scientific word for what musicians call pitch is frequency. The higher the note on the staff, the higher the pitch of the sound. It doesn't matter which clef is used, this rule is always the same. If the notes are higher on the staff, they are higher in pitch. If the notes are lower on the staff, they are lower in pitch. Notes can be on a line or in a space. When a note is on a line the staff line runs through the middle of the note. When a note is in a space it sits between the staff lines. In both of the examples above the first and last notes are on lines, the middle notes are in spaces. When two staves are joined together the Grand Staff is made. I will use the Grand Staff as a teaching tool on this site. 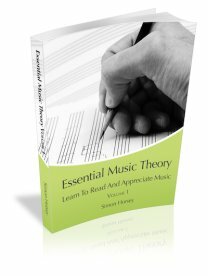 You may think you only need to learn the Treble (G) or Bass (F) clef for your particular instrument, but you will learn much faster and have a more complete knowledge of music theory if you learn to read music using the Grand Staff. Click here to learn about the Grand Staff and start learning how to read the notes!